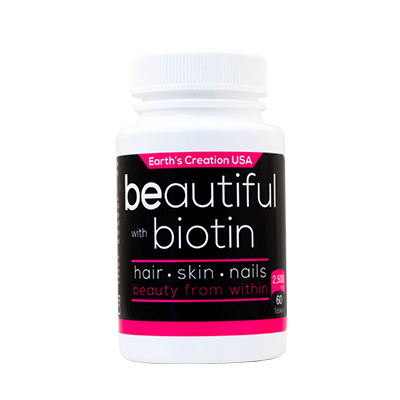 Beautiful Biotin® has been shown in multiple studies to improve firmness, hardness, and thickness of nails. It helps promotes hair growth by playing a vital role in the production of amino acids, the building blocks of protein. Biotin also helps monitor and regulate several bodily functions, like the production of new skin cells and proper functioning of the oil glands. Having low levels of Biotin, other vitamins, or nutrients in general can damage both your inner health and outer appearance. Biotin deficiency is known to cause thin, brittle and splitting of the hair, and even hair loss. Due to Biotin’s ability to metabolize fatty acids and amino acids it also may help prevent dryness and increase hair elasticity. Biotin may support strong nails since our nails are composed of keratin proteins, which relies on biotin for the production of amino acids. Amino acids being a build block of proteins. Biotin helps promote healthy skin by correcting biotin deficiency which can cause an imbalance of fatty acids our cells require to turn over and regenerate. As well, our skin relies on fatty acids as a protective barrier against the environment.